Frederick Pearson was born around 1885 and was the second son and third child of Harry and Mary Pearson. His father was born in Great Waldingfield, Suffolk but had moved to Penge in Surrey by 1881 where he was described as a ‘Clothier and Outfitter’. By 1891 the family had moved to Upper Norwood, where Frederick was born. By 1901 it is believed that his mother had died, his father remarried and his second wife Elizabeth came from Assington, Suffolk. The family later moved back to Suffolk and lived at ‘Woodruff’, Vicarage Road in Great Cornard. Frederick had 2 brothers, a sister and a half brother. Frederick enlisted and served with the 5th Battalion City of London Rifles, he later transferred to the Machine Gun Corps. His younger brother William served with the East Surrey Regiment, his half brother Alan served with the London Regiment. Harry, his older brother saw action in Salonica. The Machine Gun Corps (Infantry) was formed from infantry brigade machine gun companies in October 1915 although personnel were not formally transferred to it until February 1916. Frederick was killed in action aged 32 on 31st July 1917 on the first day of The Third Battle of Yprés, more commonly known as ‘Passchendaele. 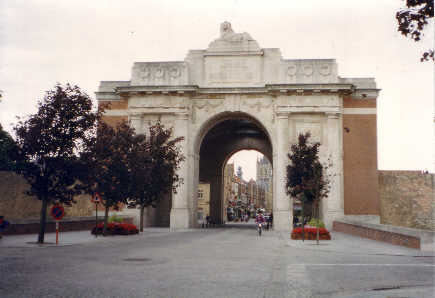 There is no known grave and Frederick is remembered on the Menin Gate Memorial, Yprés, Belgium. In just under 13 months his father had lost 3 sons. The Menin Gate Memorial is one of four memorials to the missing in the Yprés Salient and bears the names of 54,322 British and Commonwealth casualties who have no known grave and who died between October 1914 and 16th August 1917. Frederick was awarded the British War Medal and Victory Medal. A Cross of Remembrance was laid at the Menin Gate Memorial on 15th April 2006.